In the days when men were men and ET's were 'proper' ET's this magnificent machine roamed the streets of Belfast along with OZ9607 (see picture #2801). A unique feature of this ET is that it is also fitted with a mid-mounted pump. It was withdrawn from service in the mid-seventies. The livery shown in the picture features a day-glow orange front and 'racing stripe'. I am indebted to Murray Armstrong for providing this picture. Can anyone provide more details and it's eventual fate. Far too good the Lindsey Burney graveyard! (..and yes i would love to have it to join OZ9607 if it is still in the land of the living!). Ah yes, the famous F17 ET/P - a true one off ! Chassis number 4025, WPO 40634, delivered February 1955. Added by Ian Moore on 06 October 2008. The linked picture #2801 seems to gone astray and is being impersonated by a Hong Kong Scania! You could try picture number #1611 instead for OZ9607. Added by Barry on 06 October 2008. Barry, the only thing I can say: "What a beauty"! Added by Fire995 on 06 October 2008. Added by Paul Warnock on 06 October 2008. Hi Barry, Nice looking machine! It would be nice if it was still around. Added by Stewart Kaye on 06 October 2008. Added by Rick Loudon on 06 October 2008. They certainly don't make them like this anymore, what a truly brilliant ET. I bet this old gal could tell a few stories from a troubled past. Barry, thanks for sharing this classic appliance picture with us. Added by Pete Matten on 06 October 2008. As everyone has no doubt realised, by virtue of its being an F17, it was on a TL chassis. Added by Ian Moore on 07 October 2008. Added by Barry on 07 October 2008. Sorry Barry, everybody - I'm reading diagonally in my old age ! What I should have said was chassis number 4045 - the remainder ofd the details I quoted were correct though !! Now that is what a fire engine should look like! A real beauty, thanks for sharing. Added by Andy Daley on 07 October 2008. Added by Davy on 07 October 2008. Barry, I must join in the chorus of appreciation for this picture! It is a completely new vehicle to me and I am probably not alone in saying that. Does the chequer banding on the side indicate a dual or even triple function as a control vehicle I wonder? A big thankyou to Murray Armstrong. Added by Chris Wood on 07 October 2008. As Ian rightly pointed out, this was an F17 TL chassis complete with pump that was delivered as a chassis to the Belfast Fire Brigade. The bodywork was added by the Brigade Workshop Staff. It was an Emergency Salvage Tender. It also acted as a BA Tender and carried 24 additional Proto Sets. Whilst not strictly a Control Unit as we know today, it did act as a Control Point at incidents, similar to a level 1 today, (Somewhere for radio messages to be passed through). It would be very true to say that the appliance could tell numerous stories of its time in Belfast during the worst of the troubles. Sadly, it was scrapped when it left service. There was a dispute in Belfast at the time about the replacement machine, so it is quite possible that the Fire Authority wanted it totally disposed of. It's proposed replacement, a Commer Walkthru was "blacked" by Firemen and never did go on the run. An AEC, HIA 1748 Pump, was used as an ET until 1984 when a Bedford/Alexander ET was commissioned. OZ 9606 was a truly lovely looking machine, although a pig to drive, (so i've been told). Thanks to Barry for posting the original message, and to Murray for sending the photo. Added by David Lennox on 11 October 2008. It is so intersting to have the extra information from David, on OZ9607. Does anyone have any more photographs please? Added by Barry on 13 October 2008. Thanks David for the additional information. Added by Chris Wood on 14 October 2008. One last point from me on this one. Is it possible that Belfast fitted it out, and I ask this as there is nothing on the Dennis records to say that it was supplied to them as a chassis only, the inference therefore being that Dennis supplied it as a complete vehicle. Added by Ian Moore on 15 October 2008. In the book, "The Flaming Truth" by local fire historian's Bill Broadhurst & Harry Welsh, (page 210), it is stated that the chassis was ordered in March 1955 from Dennis Brothers Ltd at a cost of £2, 904.19.10 and when it was delivered a short time later, the body & coachwork was completed by the workshop staff to local specifications. Added by David Lennox on 15 October 2008. That's fair enough, I'll amend the database accordingly. Added by Ian Moore on 17 October 2008. Yes it was a pig to drive, as were all these wonderful machines.No air brakes (servo only) no power assisted steering and no sychromeshed gear change (crash gear box only)but boy it could shift with it's 8 cyl Rolls Royce engine.This appliance was a "walk through" from the crew section to rear doors. Added by SteveChapman Ex L/Fm N.I.Fire Brigade on 09 January 2009. Steve, when you say Rolls, was it a B81? Added by John Stott on 09 January 2009. John, in those days it was a B80, although outwardly the B80 and B81 look very similar. Added by Barry on 09 January 2009. Added by Jason Lester on 09 January 2009. Barry and Jason, thanks for clarifying that. Added by Tom Martin on 18 November 2011. Before rescue pumpers were developed, the combination emergency tender and pump was a rare combination. 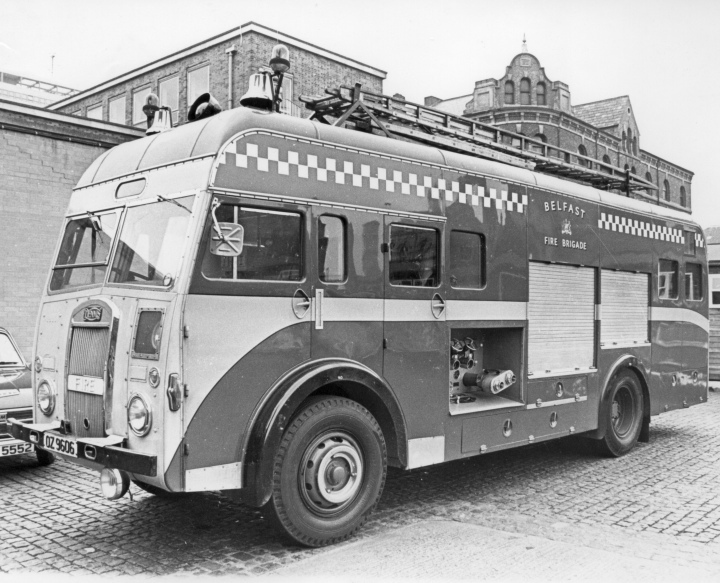 Essex had two in the early 1960s, built on Leyland Firemaster chassis, which were thinly-disguised bus chassis with underfloor engines and front-mounted pumps. I have also come across an AEC Merryweather ET with only a hose reel sytem. Do we know of any other true ET-P combinations? Added by Rob Johnson on 22 August 2014.